Manzi and Kaufman driving the Camera into the grave. Those two are as bad as Alden Capital. That hedge fund needs to wax those two. You’ll be better off for this whole ordeal Dave. Best of luck. It is a disgrace what DFM and Alden are doing to such great journalism giants. The fact that a non-newsman killed your column because it reported the news and facts is absurd. I understand doing what you have to do to keep your job, but is it a job worth keeping if you have to sell your soul to the devil? Dave you know you have been an inspiration to me since my days at the Rocky where we forged a weird friendship that I cherish. I hope that you find a place to do what you do best and they appreciate your work and ethics. Dave, my Dad would be so proud of you! The deliberate death of newspapers in Colorado would have broken his heart. Wow. Your tenacity and competitiveness made me better. This is such a sad, sad commentary on the times we live in and breaks my heart for many reasons, not the least of which is one of the most fierce journalists I know, who I could always count on to tell me the truth and hold people accountable, is a man without a desk. I think you’ll probably feel better getting out of that place anyway. Great account of an emotional, ethical battle. Good luck in the future! 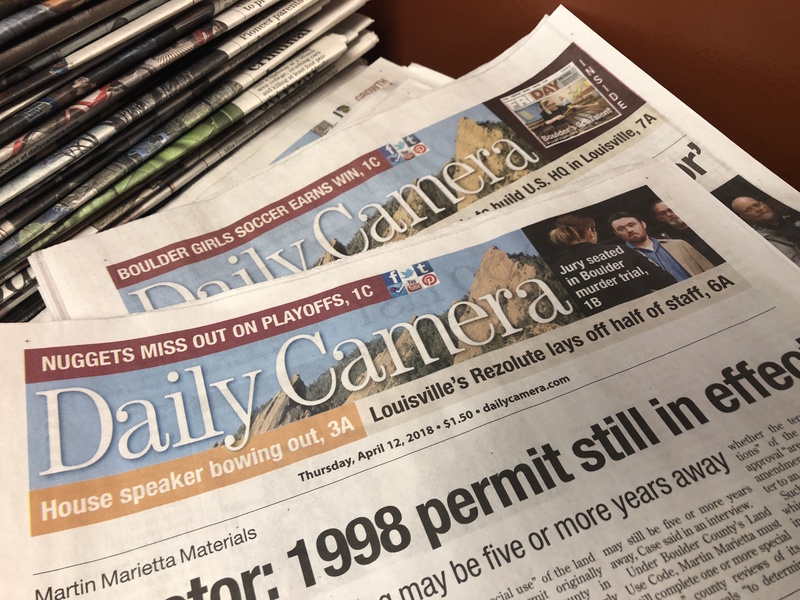 Let’s hold the Daily Camera for ransom: I think we should tell the Alden Group they have 30 days to rehire Mr. Krieger, and if they don’t, Boulder’s citizens will cancel our subscriptions and our businesses will stop buying ads. Before we let them kill the Camera, we’ll perform a subscription-assisted suicide. It is my hope that announcing this 30-day ransom period will attract sufficient publicity nationwide to incent the Alden Group to spit the Camera out to a local non-profit entity formed by local public and private supporters on or before the 30-day ransom period runs out. If they don’t blink, AG risks a rapid devaluation of the Camera’s value as subscriptions and ad revenue drop. I’m open to other ideas, but I haven’t been able to come up with a better way to pressure the Alden Group to sell the Camera to something like a “Community Information District” – see http://www.infodistricts.org. Carpe Diem! We only met once. It was during the 2017 city council campaign and I had an interview with you, Kevin, and Al. Your intensity was impressive and intimidating. When I received your endorsement (not sure how much Kevin and Al had to do with it…). I was honored. I proceeded to print that editorial on my home printer and hand it out as I knocked doors all over Boulder. Not sure if I violated some copyright laws in doing so but I was proud of the endorsement from you. The reason I say this at all is that I took a bunch of heat and shade from opponents and their surrogates for being endorsed by the Camera which was owned by a venture capital fund and that you were doing their bidding, that you were in cahoots with your corporate overlords. Those same people our now your greatest supporters. The world is an ironic place. Often one reads a story about a “hero,” someone who does good in the face of great personal adversity. An honest person reads those accounts and wonders (never really knowing), “What would I do in that situation?” In this case you have shown yourself to be a stand up guy with enough courage and temerity to warrant the appreciation of our whole community. I wish you only the best. May this episode result in something good for you. My father, David Alter, was an old style newspaper man. He would have been proud of your actions as a newspaper man, and for taking the stand. (ok, he might have ended it with a very clear description of where management could go, and exactly how to get there, but that was the old WWII Marine in him). I know I am proud of you. Dave, we’ve never met, but I’m a loyal reader of your work and spent 25 years as a journalist. You have provided a much-needed breath of fresh air as well as a large dose of common sense to this oft-myopic community. Not only do I wish you, personally, the best, but I also wish the best for the Camera and its readers. Thanks for this frank account, and please keep us informed of your future efforts. Dave, I’ve greatly admired your work over the past years. I’ve “terminated” my subscription in protest of your firing and have spread the word on social media. What has happened is despicable and I can no longer support the greedy hedge fund. To hell with them! Censorship has no place in journalism. Oh, I wrote to Al and Kevin letting them know I was done and would spread the word for others to cancel! Dave, Jay Koelzer wishes he was there to have your back — like you had his at the Rocky. He is a sentimental guy and cried when I read this blog post. We both applaud your bravery and wish you the best. The death of journalism is a frequent topic in the Koelzer household. Kudos to you for your honesty. We wish you the very best. Rock on, DK. There’s nothing else I can add. Rock on. No clouds can dull the Sun. Your brilliance to power the new kind of honest journalism that is today’s mandate cannot be curtained. You represent high integrity, well researched, curiosity driven, and relevant journalism. Launch a new news and commentary startup. Charge forward and set a new path. Tap into the network of giants like you who yearn to tell the truth for the public good and have been muted by corporate masters. Reconnect with mentors who invested in you. Seek insights from your trusted companions. Stay focused on your core: purity and service. Look ahead not back. Frame your path and march on. Life throws us in oceans we are not prepared to swim in. But you have survived many fires and you will emerge stronger here too. You have it within you to create a new reality in honest storytelling. Lead the pack for all who need an intrepid and wise leader that you are. I agree totally w/ Rajeev! Readers: Don’t push for a Camera buyout. Support a new daily paper in Boulder,let the Camera go bankrupt and let theAlden people rot in hell! For as long as I can remember and that’s nearly four decades I have admired if not worshipped your efforts to tell true stuff. Thanks for your lessons on truth and journalism – one of them came in a most pointed Facebook comment just two years back – and thanks for your commitment to a free and unfettered press. I’m sorry to see you go and also sorry to see the CAMERA, apparently, go. I came to Boulder to attend C.U. on a journalism scholarship, intending to have a career as a journalist. As Fate would have it, I got sidetracked, and I earned a B.A. in English literature instead, but continued to write all my life, publishing three books, various short stories, a great number of movie reviews and numerous articles and opinion pieces. Once I even applied to be the features editor at the CAMERA, but was turned down. Newspapers can’t compete with the instant news outlets on the Internet and on cable-TV, but they can compete as a publisher of in-depth stories “behind” the news and informative opinion pieces such as you write. When I came to Boulder, both the CAMERA and THE DENVER POST were afternoon publications. If the CAMERA is to survive as a printed publication, perhaps it could go back to being an afternoon publication, so that the audience can have more time to read the pieces at their leisure. I will keep my subscription for the time being, but now I am also following your blog. Dave – We’ve never met, and to tell it straight, I’ve been opposed to you as often as I’ve been with you in regards to your perceptions of local events. Nevertheless, it’s you and yours capacities to incite thinking and discussion that remains the lifeblood of our democratic society. A way to re-create the services provided by a local newspaper, un-beholding to a philosophy of hyper-profitability, is essential to the long-term survival of a free and democratic society, the Camera and Boulder included. I’m with Ed Byrne: I’ve unsubscribed the Denver Post and will do the same with the Camera and to whatever degree possible I’ll try to abet the creation of a 3LC (low profit limited liability) local newspaper. Sign me up. And the proof in the pudding is the sound coming from today’s Daily Camera: crickets. Best of luck, Dave. I didn’t always agree with your editorials but I always appreciated the thought that went into them. BTW, I saw much the same thing happen in my many years doing work for KBCO. Corporate bottom-liners using slash-and-burn tactics to gut what was once a vital and creative radio station. Dave: What occurred is not a big surprise but is a major disappointment. You brought so much that was fresh and genuine to an otherwise failing newspaper. Your stand is appreciated and the end of the story is yet untold. We will miss your forthrightness. I think the only way to stop Alden is to cut off the cash, and the possibility of doing that with most success was before the last round of cuts. It’s obvious what the game plan is at Alden, and current staff are all short timers. If staff had united and locked stopped publishing in a place with a significant footprint such as Colorado where would Alden find replacement workers to get the paper back up without a revenue crisis arising? In Southern California, the cuts have been draconian. Former SCNG flagship LA Daily News has three reporters covering news. What next? This is a new game, and to beat ugly, sometimes you have to get ugly. Not sure if this is the T.J. I’m thinking of, the famous former L.A. Timesman, but I don’t have an email for him and no email shows up on these comments. If you’d rather confirm privately you can use the direct message feature on Twitter. The reason to cancel your subscription is because the paper’s not as good now that Dave’s gone, nor can it be trusted as a credible news source. I’ve read your editorial, and I call it “intelligent and restrained.” I think you wrote a terrific piece, an absolute bulls-eye. If you need a reference, have them call me. Krieger, I recently read that the new model for newspaper journalism could only occur after the industry had totally imploded and burst into flames, then and only then, it might be rebuilt in someone’s garage, built on dedication, integrity, ethics and community duty that molds every successful journalist. The lunatics are running the asylum and they are shitting in their beds. They’ll soon be moving on. What’s in your garage? I don’t know you nor have I read your work before this blog. But, I admire your candor and your guts. Perhaps this is the impetus to writing a book or a movie script. Thanks for a most stimulating series of editorials during your tenure. I know that many in Boulder did not always appreciate your take on the muni and on growth policy, but I sure did. What’s happening to daily newspapers is devastating; respect to you for speaking truth to power. Hat’s off to you Dave. The dilemma is whether abandoning the Camera sends a message or wounds the corporate toadies, or simply hurts the few remaining employees, and only accelerates the imminent demise of an historic Boulder symbol. I fail to grasp where all the mega-lottery winners go, when any one could easily fund an endowment to run a truly independent paper in perpetuity. Our clueless, self-congratulatory city officials keep wasting money and energy on issues we have no legal powers to change, staffing with millennials with no concern for Boulder’s actual history or natural uniqueness, only cheap housing forever, for the squalid millions expected over the next 50 years. The chill of authoritarianism runs down our backs as we witness how it began in Germany – first you silence the press. Dave… Since my sons were little, I have told them that when you do the right thing it will cost you. You did the right thing. And it cost you. This moment on your path to new adventures is not the end of what you began when you published the editorial on your blog. It is the beginning. There is more work that needs our attention. I will work with you to start something big, something right. Your work as a sports writer/columnist is second to none. So… who owns the Green Bay Packers? Let’s start a grassroots campaign and ask every Colorado resident, men, women and children, for $5 so the citizens of this state own the Denver Newspaper Agency and all the newspapers in it. Let’s do it. I will commit the first $1,000. Email me so we can exchange mobile numbers. And finally… remember this… editors are only editors because they can’t park cars. Your suggestion reminds me of how Josie Heath started the Millennium Fund for the Community Foundation. It’s an interesting idea. Dave, you remain a most principled man, and simply the best writer in our region . The state of the newspaper industry is both sad and reflective of the assault on journalistic integrity beginning on Pennsylvania Avenue. I was about to give up on the Daily Camera when Dave Krieger came on board and reinvigorated the editorial page while writing some of the best editorials the Camera had seen in years. ‘Comforting the afflicted and afflicting the comfortable,’ Mr. Krieger often challenged the inbred group-think Boulder (myself included! ), and it’s representatives often suffer from. I am at a loss; should I continue to subscribe to a paper I’ve faithfully read since 1969 in the face of such cowardice by the Publisher and the leeches at Alden Captital or throw in the towel in disgust. I pray that some local investor(s) with a fervent faith in the fourth estate will emerge to provide honorable employment for the likes of Dave Krieger and Mike Littwin who are to be treasured, not scorned. Democracy is so ill-served by these terrible Alden people. No sense of decency, and no understanding of citizenship or public responsibility. A commentary on our system gone awry. So how to respond? Many have offered to buy the Post and the Camera, but so far no response from Alden that I know of. Of all the strange developments, apparently the Colorado Springs Gazette-Telegraph is now the most robust daily in the state; maybe they will watch the Denver area papers simply die, and then they will expand north. As a regular letter writer and an occasional op-ed contributor (i.e., free content provider) to the Camera’s editorial page, I have been consistently impressed with Dave Krieger’s editorials and general work since he took the helm. Everyone should cut the economic chord to the DFM/Alden overlords, and unsubscribe in protest, as suggested by Ed Byrne in an earlier comment in the original blog posting. Make the Camera’s business worthless, so it can be sold at a decent price to a new local owner that gives a damn, and who can restart with integrity. I mean really, the front section of the paper Daily Camera every day is a set of half-page ads designed as fake news stories selling questionable medicinal cures to an imagined ignorant readership. It’s pathetic. Dave, Thank you for your courage. Boulder and our democracy needs an independent, vetted, edited source of the news, Sadly, the Camera is no longer this. After 40 plus years I am ending my subscription to the Camera. While I will miss an actual paper newspaper, it is my hope that there can be an online Boulder daily newspaper meeting the above requirements that I can subscribe to. I agree with Ed Byrne! Dave, we’ve had some disagreements in the past but I have come to respect you more as time went on. I hope you land some place where they appreciate your guts. I, like others, would happily join in a movement to screw Alden and create a new local. Laurie Paddock is spinning in his grave! I’m sad that this happened to you, Dave. We always enjoyed your commentaries, although sometimes we disagreed. Nonetheless, you provided great food for thought. I’m hopeful that this bodes ill for the Camera, but out of the ashes will come a new publication that tells the truth. Thanks for the editorials! Dave, I have enjoyed reading your editorials for years. You have provided a very reasoned and thoughtful approach to everything you have written, which doesn’t always happen in Boulder. Thank you for taking the ultimate stand and letting our community know what has happened to journalistic freedom. When one door closes another opens-may it be fantastic! Dave…I was astonished to hear of your termination but I certainly agree with all of the comments offered by others here! You were an inspiration to those of us who love and respect local journalism and seeking the truth…best wishes to you on whatever may come next! Dave, I still remember the first time I heard you on the KOA afternoon sports talk. It was very clear that you had a command of the English language rarely heard outside of Public Radio. Listening to you was fun and interesting. And then one day you arrived on the Boulder scene and I was delighted. Your contribution to the editorial page of the Camera was immediate and appreciated. I’ll miss you…we’ll miss you. We can only hope our paths will cross again and soon. May the wind be ever at your back. Dave this is terrible. I love reading the local paper every day. Helps me to know what is going on here in my back yard and gives me a sense of community. And the lack of any mention of this in the Camera reveals how deep this censorship has gone. We all need local news, because once the paper covers too large an area and too large a populace, it is directly relevant to no one and becomes entertainment. You are in the right, they are in the wrong. Some good will come from this pain. Thank you and damn them. I will honor you tonight at city council…then continue to reveal the truth about the Muni. Thanks for making the Camera so good. I pray the talent that remains has your courage and can carry on. I write from the grave where I am quietly rolling over. Thanks Dave for your principled stand. I agree with other comments about making Alden investments perform poorly. When the revenues decline they will then be interested in selling- at a nice low price. This goes for the Post as well. How can we gauge the amount of support for subscription cancellations?